The latest VivaVideo APK has been updated to 4.7.2. Smartphone is now very effective to support the daily life especially when it is related to the digital item. Taking photo and video is now can be done with fingertips. It makes everybody are easier to get high quality and high skilled videography. To edit it properly, VivaVideo for android will be available for any version of Smartphone devices. 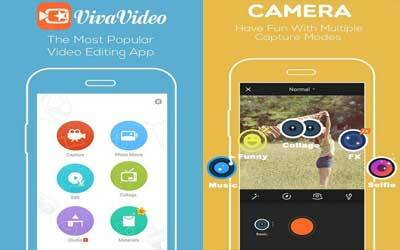 It is one of the video editor apps, in the same time it can also be used as the slide show maker. The ease of use make this app is downloaded by more than 100 million users all around the world. VivaVideo bring improvement in every version that is released. Now the presence of this editor is very valuable. You can use the editor to apply several of creative video camera lenses. It can give you possibilities to have multi capture option when you take picture from the app directly. They are basic, FX, selfie, funny, music video and even the collage options. With the presence of exclusive selfie camera you can have different setting of lens effect. It also have a special option to make you are easier in taking vide directly for the need of Instagram and vine. Besides the presence of photo movie maker and video collage, the main spec of app which is really needed is its powerful video editor. The editor can give you a very professional result even you just edit them in couple of minutes. All the video that has been taken can be processed professionally such as trimmed, merged and so on. There are also some slow and fast motion menus as well. If you want some color impression there, some filters, transitions and live dubbing are also available. You can use them and preview the video in the VivaVideo for android before you finally render it to your Smartphone gallery. MORE free music is ready for your video!